While many modern workers feel chained to their computer screen and chair from nine to five, more workers are looking for alternatives to the sedentary office lifestyle. You’ve probably heard of standing desks, treadmill desks, and medicine ball chairs for the office. Now, more workers are looking to office Yoga for relief. The UK study, published in Medical Xpress, involved 150 National Health Service employees in North Wales. 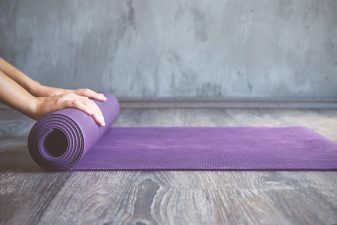 Researchers randomly divided the subjects into two groups; one was assigned instructional books on back pain management, while the other practiced eight hour-long yoga sessions. After an eight week period, the yoga group reported feeling less pain than the educational group. On top of this reduction in pain, the yoga group also reported fewer medical visits for back pain during a six month period. According to Medical XPress the specific yoga program involved movements to stretch the shoulders, hips, and spine. The goal of the sessions is to promote better posture and overall well-being, and was based on the Dru Yoga method. Yoga and mindfulness during the workday has taken off recently in the U.S., offering both physical and cognitive benefits. A study published earlier this year found that between 2002 and 2012, yoga practice for workers almost doubled. So, the next time you need to boost productivity at the office, you might want to roll out a yoga mat next to your desk.